I thought this would be a trip all about having fun in whitewater and seeing sites most people never get to see, and it was all of that. What I did not realize was how great it is to be cut off from the rat race of life for a week and totally engaged with my family and fellow travelers to enjoy life as it used to be, without any of the burdens of society. I come from the big city where I am effectively on call 24/7 and this was my first total escape since I got married 18 years ago. The office survived and I am all the better for it. 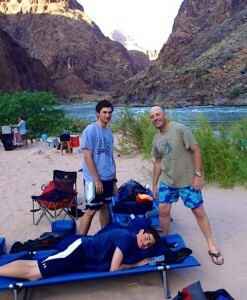 And my kids really appreciate finally getting 100% of me for the time we were in the canyon. I could not recommend more highly for a city person to try the experience. And oh by the way, Western's approach to the Grand Canyon tour with its j-rig boats give the best of all worlds. The boats allow you to see much more of the canyon in a week than you could on a more traditional oar powered craft, yet if you sit in the front you still experience all the excitement of the best whitewater rafting. Totally a 5 star trip.